On this evening with no moon, use the planet Jupiter and Great Square of Pegasus to star-hop to our galaxy’s south window. In other words, you will be looking away from the flat plane of the Milky Way – where most of our galaxy’s stars reside – southward toward intergalactic space. Can you show me a detailed view of the Milky Way center? Here is how to do it. Every year in early November, the Great Square of Pegasus lies appears in the east to southeast sky in early evening. It appears high in the south to overhead by about 9 p.m. This large asterism really does look like a large square pattern, with four medium-bright stars marking the corners. Throughout 2010, the planet Jupiter will blaze away in between the Great Square and the star Fomalhaut. It is so bright that it can help draw your eye to these objects. In any November, you can count on the Great Square to locate the star Fomalhaut. Draw a line through the Great Square’s two westernmost (or right-hand stars), and extend that line southward to land on the bright star Fomalhaut in the constellation Piscis Austrinus the Southern Fish. Why find Fomalhaut? When you look at this star – sometimes called the Autumn Star or the Loneliest Star – you are looking some 90 degrees from the plane of our galaxy’s equator. 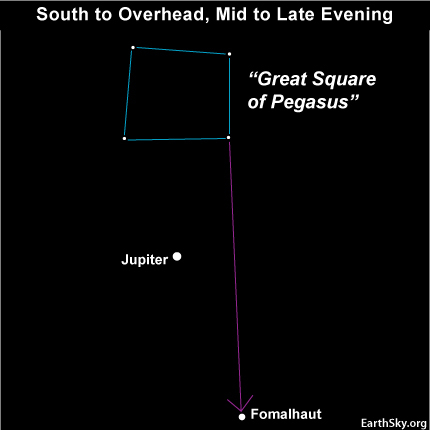 Remember the Great Square of Pegasus and the star Fomalhaut, and you have what it takes to look out the south window of the Milky Way galaxy! Just remember, the Great Square and Fomalhaut return to this same place in the starry sky at this same hour every November 1. However, Jupiter will have moved away from this part of the sky by this time next year. Site contents copyright © 2019 Recorder Online	except as noted. All rights reserved. | 88 queries in 2.194 seconds.